One afternoon this past weekend I decided to make Gougères. 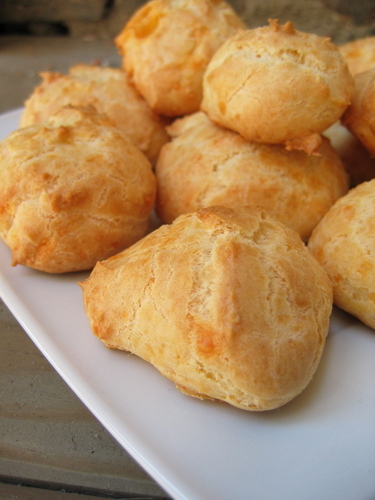 These airy, eggy, crusty puffs of pâte à choux are delicious right out of the oven. Traditionally they are made with Gruyère, yet I used this recipe from Leite's Culinaria (and omitted the chives because I did not have them on hand). This is such a quick appetizer to make. It might take a few attempts to get the pâte à choux the right consistency, but once it comes out correctly it will be simple in the future. They serve something like these as an appetizer at one of me and my boyfriend's favourite restaurants - I'm not sure I'd like to try making them myself, 'cause that would just take the adventure out of eating them there! But, you know, I've bookmarked the recipe just in case! ;-) They look so pretty! Gougeres are a favorite of mine. I made some once with shrimp and tarragon that were really good, and I've considered cheddar but haven't tried them yet. I think now I'll have to. Thanks Zarah, they are so easy too! I don't know if I would want to learn how to make something simple that has always been part of a special occasion for me, it might take the fun out of it. You can use many different kinds of ingredients and spices with them though, so perhaps you could change it enough so they wouldn't be as similar. Kevin, shrimp and tarragon sounds quite good. I will have to try making those as an appetizer next time we have a party at my house. I thought the cheddar worked very well and with the addition of some dill it would be superb. Let me know how they turn out! Mmm. That sounds like a lovely memory. They are so easy! You should give them a try. Thanks Lyn! Thank you also for hosting the event! Your gorgeous photo of gougeres tempted me right over here from the DMBLGIT photo contest on Lex Culinaria. Yum! I haven't made them in years. And you're right--they are so easy. Neat blog. Can't wait to read more of your delicious posts! Thanks farmgirl. There are so delicious. Having this picture up for DMBLGIT reminds me that I need to experiment more with different ingredients. Wow! this bread looks a delicious knowing that there's a lot of cheddar inside yummy! These are so delicious and decadent - but much simpler to make than I previously imagined. The cheese is spread throughout and they have a great flavor. Enjoy!